RIP. Gone, but never forgotten. The Minnesota Wild announced today that founding chairman Bob Naegle has passed away after a hard fought battle with cancer. Naegle’s impact on not only the Wild and the NHL, but Minnesota hockey in general is enormous. Many credit him as being the most instrumental man in the NHL’s return to Minnesota. With heavy hearts, the Minnesota Wild joins the hockey community in mourning the loss of former chairman Robert O. Naegele, Jr., who passed away due to complications from cancer Wednesday night in the Twin Cities, with his family by his side. When there was a push in the late 1990s to bring the NHL back to Minnesota, Naegle was the one who ultimately pushed things forward. When Gary Bettman said, "We love your market and your investor group, we never wanted to leave Minnesota, but I need one person I can call when I need to get decisions made," Pop stepped forward and said, "OK, I will do it,” said Naegle’s son Bob in a statement earlier today. SAINT PAUL -- The NHL's Minnesota Wild joins the hockey community in mourning the loss of former Chairman Robert O. Naegele, Jr., who passed away due to complications from cancer Wednesday night in the Twin Cities, with his family by his side. The Wild will honor Naegele with a moment of silence prior to its next home game on Nov. 13 against the Washington Capitals. In addition, the team wear a patch with the initials BN on their jerseys for the remainder of this season, starting with Thursday's game at the Los Angeles Kings. Further details on how the team will honor Naegele's memory will be announced soon. We are deeply saddened by the loss of our much-loved 'Pop.' While he had many professional and business successes in his life, the pinnacle for him was to play his part in bringing an NHL team back to the State of Hockey. The Minnesota Wild was never about him. Mom and Pop were happily on the beach in Florida enjoying the start of retirement in 1997 when the opportunity arose to bring an NHL franchise back to Minnesota. When Gary Bettman said, "We love your market and your investor group, we never wanted to leave Minnesota, but I need one person I can call when I need to get decisions made," Pop stepped forward and said, "OK, I will do it." From day one, for him, it was all about the fans and the amazing Minnesota hockey heritage. It is a testament for how he lived his life. From the first time that I met Bob, when we were both introduced as new NHL owners that summer of '97, I was impressed by his passion for the game and his love of his home state. A piece of his heart and soul will remain forever as a part of the Wild. We will honor that. My family and I are so fortunate to have the chance to build on the great foundation he established here. The National Hockey League, the Minnesota Wild and hockey fans across the State of Minnesota have lost a dear friend with the passing of Bob Naegele. 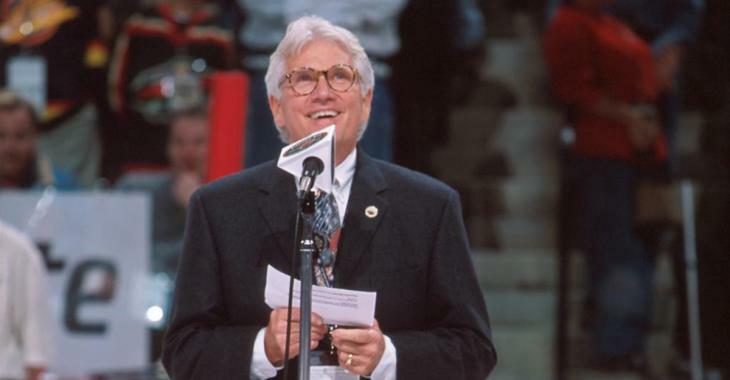 More than 20 years ago, Bob had a vision -- to return NHL hockey to the Twin Cities and to ensure that the great fans in the State of Hockey would have a state-of-the-art arena in which to cheer for their beloved Wild. He worked tirelessly, often in the face of long odds, to ensure that his dreams became reality. Bob characteristically deflected the credit to others, but in 2008, the NHL presented him with the Lester Patrick Trophy for his service to hockey in the United States. He was passionate about the game, loved his home state, and he cared about hockey fans. We will miss him and extend our deepest sympathies to his wife Ellis, four children, 10 grandchildren and countless friends. Bob Naegele was a friend and mentor -- I will miss him dearly. As a mayor, I dreamed great dreams, but it was Bob Naegele who had the skill and the faith to turn those dreams into reality. The result was the Minnesota Wild. Bob's faith is what always guided him. The Bible says faith is confidence in what is hoped for and assurance in what we do not see. Bob was confident the NHL would return to Minnesota, and he saw what many others did not see -- that it would succeed in St. Paul. His faith never failed him. Bob Naegele was a dreamer, a dreamer with conviction. And the more challenging the dream, the better. As a dedicated Minnesota hockey fan, he dreamed of returning the NHL back to the State of Hockey, where it belonged, even in the face of many doubters. We are all grateful to the dreamer who made the return of the NHL possible, as will be future generations of the Minnesota hockey fans. We will all miss Bob greatly. I am forever grateful to Bob for his multitude of good works. From Rollerblade to the Wild, and everything in between, Bob led his companies with integrity and humility. Above all, he treated everyone with equal and utmost respect regardless of title or tenure. As a result, his legacy is not measured in dollars and cents, but rather in hearts and souls. In the late 1990s, Naegele, along with his son Bob Naegele III, were part of an informal association of hockey enthusiasts whose dream was to see the return of NHL hockey to Minnesota. Over time, he stepped up to become the lead investor of the group, and partnered with Saint Paul Mayor Norm Coleman and Governor Arne Carlson to finish the job. Minnesota hockey fans realized that impossible dream: on June 25, 1997, the NHL announced that Saint Paul was awarded an expansion franchise.